Portland’s family-friendly hotels reflect the city itself - some historic, some swanky, and some downright quirky. But all offer visiting families that extra bit of hospitality necessary when traveling with kids. It’s like staying in a candy store where the decor - vibrant, cheery, and whimsical - matches the jars of complimentary salt water taffy and Starbursts in the lobby. Inn at Northrup Station offers perfect accommodations (with full kitchens) for families, especially large broods. There’s a free breakfast (fresh waffles! ), free streetcar passes, and a rooftop terrace for relaxing. Steps from the hotel, you’ll find the trendy neighborhood of Nob Hill with the city’s most popular boutiques and restaurants. Starts at $151/night. KidTripster Tip: I recommend having dinner at Marrakesh, just one block away, where you sit on pillows and poofs while enjoying authentic Moroccan fare and belly dancing. You can’t miss this bright yellow hotel situated in the Pearl District just over the bridge from the Moda Center. Rooms are spacious with living rooms and kitchens but avoid those on the railway side of the hotel. Breakfast is free with lots of choices. Residence Inn is pet-friendly and has an indoor pool. Starts at $219/night. KidTripster Tip: Skip the valet and use the self-park garage around the corner. This hotel has as much quirky character as the city itself. Well-located in downtown, the hotel offers suites with separate bedrooms and a living room with a sleeper sofa. Monaco Hotel hosts a nightly, kid-friendly happy hour with complimentary wine and beer for parents and Italian sodas, hot cocoa, and seasonal goodies for kids. Kids love the resident Director of Pet Relations, a Golden Retriever named Dakota. And, if they want to take care of their own pet during their stay, you can request a goldfish as part of the hotel’s Guppy Love program. Starts at $215/night. This chic hotel is best suited to hard-to-please teenagers, though it does welcome younger kids with coloring books and mason jars filled with candy. The centrally-located property has great access to shopping and public transportation, including MAX Light Rail and the Portland Streetcar. The Nines is home to two of Portland’s top restaurants, Urban Farmer and Departure, better suited to a parents' date night. Starts at $339/night. How many kids can say they’ve slept overnight in a school? Originally built in 1915, the converted elementary school is situated in the hip Alberta neighborhood. Rooms are large; some have the original blackboards and coat closets. The Kennedy School also has an outdoor salt water soaking pool (open to the general public, as well), multiple restaurants, an on-site brewery, and a movie theater that shows second-run movies nightly. Starts at $135/night. KidTripster Tip: I’d recommend staying in the older part of the school for a more authentic experience. Don’t be put off by this budget hotel’s location when you drive up. Though just off the highway, Holiday Inn Express is actually within walking distance to great restaurants and cool shops in the popular Nob Hill neighborhood. It’s also a three-minute walk to a Portland Streetcar stop. The hotel has a small pool, free parking, free WiFi, and free breakfast with warm cinnamon rolls. Starts at $152/night. Hotel Vintage has great room layouts for families. The Skyloft rooms are visually stunning, but the specialty suites are even better for families with either a sleeper sofa or separate bedroom. As part of its $16-million renovation, the hotel added a game lounge, complete with shuffleboard, billiards, and TVs with gaming consoles. Some floors have computers set up with the Oregon Trail game along with board games, like Connect Four and Jenga. Parents can enjoy complimentary wine tastings, and everyone can enjoy free use of bikes. Starts at $185/night. RiverPlace is one of the city’s only waterfront hotels and sits adjacent to a city park, which the hotel encourages guests to take full advantage of with kites and Frisbees, available for use. It also has a bunch of kid-friendly amenities from a Bedtime Butler - who makes nightly rounds with a cart of treats for kids and nightcaps for adults - to adorable kids tents for indoor campouts. Starts at $225/night. Ok, this historic lodge is not in Portland, but it’s worth the 1 -1/2-hour drive to the top of Mt. Hood to stay here. Dedicated in 1937 by President Franklin D. Roosevelt, Timberline offers rustic elegance with fireplaces and original wood furnishings in each room. Watch the in-room video about the lodge and then go hunting for the many wood carvings throughout the property. Afterwards, take a dip in the year-round, outdoor heated pool. You can hike in the summer and ski in the winter (though it is possible for experienced skiers and boarders to hit the slopes during the summer months, as well). And make sure to say "hello" to Heidi and Bruno, the resident St. Bernards. Starts at $270/night. Portland is a city that’s big on the shared economy movement. Many families are willing to rent out their homes or swap homes for a specific time period. 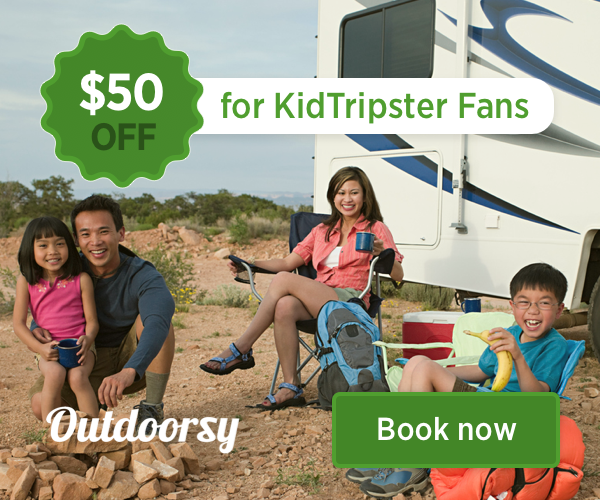 KidTripster recommends websites like Home Exchange. Look for families like yours who are offering their homes in areas near your preferred attractions. For more on what to know before renting or swapping, click here. For Top 10 Eats in Portland, click here. Editor Shellie Bailey-Shah lives in Portland with her husband and two sons. While a native Michigander, she loves the Pacific Northwest and can’t imagine living anywhere else.